Part Used & Method for Pharmaceutical Preparations: The seeds are gathered in autumn and dried in the sun. 1. Upward disturbance of liver fire or invasion of exogenous wind and heat manifested as red, swollen and painful eyes and photophobia. Cassia seed (Juemingzi) is used with Chrysanthemum flower (Juhua), Mulberry leaf (Sangye), Capejasmine (Zhizi) and Prunella spike (Xiakucao). 2. Constipation due to dryness in the intestines. Cassia seed (Juemingzi) can be used alone. 3. Hyperactivity of liver yang manifested as dizziness, vertigo and blurred vision. Cassia seed (Juemingzi) is used with Uncaria stem (Gouteng) and raw Oyster shell (Muli). 4. Deficient yin of the liver and kidneys manifested as blurred vision and cataracts. 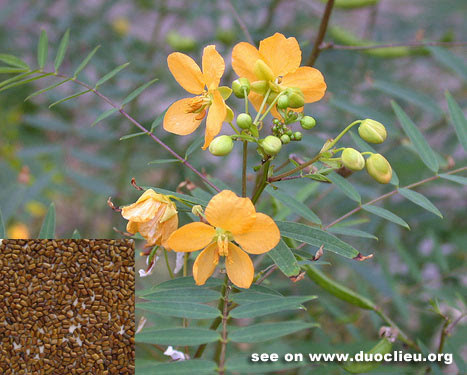 Cassia seed (Juemingzi) is used with Flattened milkvetch seed (Shayuanzi), Tribulus fruit (Baijili), Grossy privet fruit (Nuzhenzi) and Wolfberry fruit (Gouqizi).